DESCRIPTION: This 80-hour course is designed to train individuals to be Firearms Instructors. The course covers firearms knowledge, teaching techniques and lesson planning, range preparation, combat shooting techniques and safety. Each attendee will be required to demonstrate competent teaching techniques, and proficient use and safety of firearms prior to receiving certification. The qualification courses are listed below. PREREQUISITES: This course is highly challenging. It is an instructor's course, not a basic firearms school. Students are expected to be proficient with their departmental firearms prior to attending this course. Students must be full-time peace officers, or active duty military personnel. All students who are not members of the Alameda County Sheriff's Office must sign a liability waiver. REQUIRED EQUIPMENT: Duty weapon: three magazines (minimum) with pouches for semi-autos, two speed loaders with pouches for revolvers, support equipment for duty weapon, and agency shotgun or patrol rifle/carbine. Ammunition needed: Minimum of 1750 rounds for duty handgun, 250 rounds .223/5.56 mm, 150 rounds of shotgun buckshot and 50 rounds of rifled slug. Additional equipment: ballistic vest, off-duty concealment holster and weapon (100 rounds of ammunition if different than duty weapon), ear and eye protection, clothing suitable for outdoor range (no shorts), and a flashlight. No denim/blue jeans, red hats or red shirts are allowed on the range. During this class students will be creating course outlines and other student projects. It is recommended that each student bring a laptop computer and flash drive to assist them with this portion of the training. 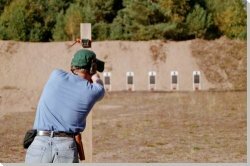 CERTIFICATION: Students must fire a minimum score of 90 % (36 out of 40 possible) on the "Instructor Handgun Course" on the first day of the course in order to remain in the class. Students must also fire a minimum score of 80% ( 240 out of 300 possible) on the "Bullseye Qualification Course" by the end of the first week in order to successfully pass the course. START POSITION: Handgun in the low ready position and cocked into single action. On command shooter fires 10 rounds in 4 minutes. All rounds single action (SA). On command shooter fires 5 rounds in 20 seconds. All rounds single action (SA). Upon completion shooter prepares for the second string of 5 rounds. On command shooter fires 5 rounds in 20 seconds. All rounds single action (SA). On command shooter fires 5 rounds in 10 seconds. All rounds single (SA). Upon completion shooter prepares for second string of 5 rounds. On command shooter fires 5 rounds in 10 seconds. All rounds single action (SA). PASSING SCORE: 80% - 240 points out of 300 possible. SCORING: Only hits in the 4 and 5 zone will be counted for score on this course of fire. PASSING SCORE: 90% 36 hits out of 40 possible.